Tani would not look at him. “M’lord need not concern himself with that.” He frowned. Paul always despised it when people hid things from him. It made him feel like he wasn’t worthy of knowing it. His grip on her arm got tighter and she squirmed. “Tell me,” he insisted. She looked up at him, eyes suddenly fierce. Her jaw worked like she was chewing on her words. Finally she exhaled and looked away. “Of a sort,” she said. There was a groan and she looked deeper into the house, reaching for the curtain that separated the pantry from the rest of the house. “Please, ask me later?” He nodded and they slipped through the curtain. On the other side was an orderly chaos. Blankets, cooking ware, more herbs and feed were stored about the place in what seemed to be random piles against the wall. On closer inspection, Paul discovered they all contained the same items. It looked as though they were laid out for distribution. There were four windows in the rooms that faced equally east and west and ran along the long side of the rectangular room. Hanging from exposed rafters were pheasants and ducks, waiting to be plucked and skinned. A blood cauldron was against one wall, one of the pheasants dripping its last remains from a torn neck. A black cat crossed through the sunlight that came through one of the windows, flicked its tail into the air and disappeared into the shadows. The look of the old woman made Paul’s heart sink. He’d heard that cough and seen those spots before at Hallowed Hill. We’d shut them all out, left them to die in the cellars. All those servants. He felt suddenly sick. Having only been five then, Paul didn’t feel responsible but the memory made him remember the screams, the cries for help, the coughing. The coughing never ended. “I know,” he said. That was mother’s gift to me. She went to the woman, fetched a pipe from a sack nearby the bed and pulled off a leafy root from the rafters. Using a small bladed knife she cut the leaves into small fragments and stuffed them into the bowl of the pipe. “I know you,” the old woman suddenly croaked, pointing a gnarled finger in his direction. “The Hallowed Son. The raven with the inner eye.” Her mouth had only two teeth and her gums were running black from dried blood and milkweed. He felt his stomach twist. Inner eye? The old woman reached up for the pipe and took it, placing the thin tube’s end in her mouth. She inhaled deeply and held it, laying back on the bed as she slowly exhaled the smoke from her lungs. “I knew your father,” the old woman said so softly that Paul had to strain to hear. He frowned. How could this simple farm woman know my father? “My father won this land from the Torley’s when he was not yet a man grown,” Paul said, feeling his cheeks flush. And I ran from a battle when I was a man grown. The old woman smiled and opened pale eyes towards him. “And then he went to lance a bear at his wedding and made a bed covering for his pretty new wife.” Paul nodded, having heard the tale a hundred times. “Where did you meet him?” he asked, impatience in his voice. He wasn’t sure why he needed to know why this old woman knew his father. Plenty of commoners knew his name. He’s a hero for bloody sake. The old woman smiled faintly and continued to look at Paul. He felt sick inside and also angry. How dare this woman talk about my father like that. Still that look she gave him was not mocking, nor was it accusing, it was a kind smile. “I bandaged and touched up his scrapes. His men and horses too, me and my husband… Made to go the day after, having had our… our bread and water and made a mess of the house.” She was wheezing, her words interspersed with short, shaking breaths. Still her voice was kind, like she was breaking bad news to him gently. “My husband asked for a small payment, for his lordship to please come take care of the bandits that come down from the Mossfield way. Your father he…” the old woman faltered then and closed her eyes, rubbing her forehead. Tani came to her then, easing her back onto the bed. “Rest nana, please. You’re weak and I need to take him for a bath, he’s requested it…” They spoke in hushed whispers then and Paul could no longer hear them. His thoughts swam as he leaned against the wall, a hand to his face. My father stopped here? Why here of all bloody places? There’s nothing here! The old woman could say no more and so they went. 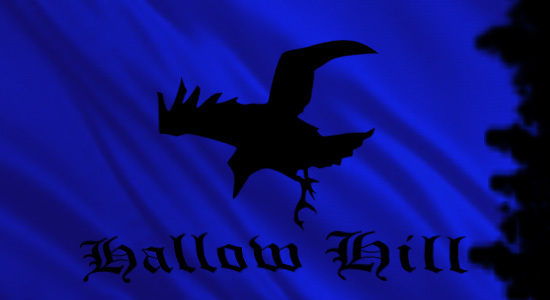 This entry was posted in Fantasy, Original Fiction and tagged blog fiction, Fantasy, Hallowed Hill, The Aranor Saga. Bookmark the permalink.